Next month, chiefs of police from across Ohio will gather at the Ohio Chiefs of Police In-Service and Annual Conference. Traffic Logix is proud to be exhibiting our solutions for safer roads at the conference. We will be showcasing our speed enforcement cameras, speed display signs, and recycled rubber traffic calming products. The conference will be held at the Hilton Columbus-Downtown Ohio. It will take place from May 5- May 7. The event will include a range of fascination education sessions. Some topics include criminal law, social media, securities fraud, and lessons learned from a mass shooting. There will also be more than 100 vendors at the event. Traffic Logix will be exhibiting in booth 901. Ohio’s roads have already seen 252 traffic related deaths in 2019. At this point last year, there were 236 deaths, a number that should have been reduced this year. Instead, 16 more people have lost their lives. There were 135,521 enforcement stops made by Ohio police. 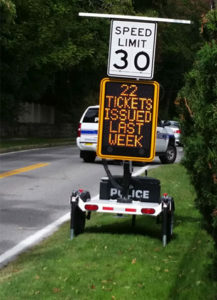 Many of those stops could have been avoided with solutions like automated photo enforcement and driver feedback signs. More importantly, many lives can be saved by slowing cars down. Traffic Logix solutions are used on streets across Ohio and throughout the country. 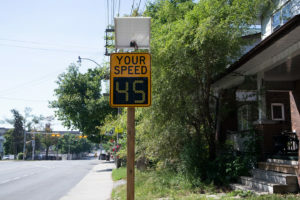 Our SafePace speed display signs remind drivers of their speeds and alert them to slow down. Our Guardian speed enforcement cameras capture license plate images of speeders and send automated warnings or tickets to speeders. The recycled rubber traffic calming solutions we offer like speed humps and cushions compel cars to slow down. Want to learn more about how Traffic Logix can help you slow cars and save lives on Ohio’s roads? Let’s get together at the Conference and have a chat. PreviousPrevious post:Can Work Zone Radar Signs Encourage People to “Drive Like You Work Here?”NextNext post:Is Distracted Driving More Dangerous in Work Zones?